Various Caribbean island states and the southern coast of the United States were devastated this summer by a sequence of catastrophic hurricanes. Killing roughly 241 people, hurricanes Irma, Maria, Harvey, and Jose wreaked havoc on the lives of thousands, literally sweeping away livelihoods and costing 100s of billions of US dollars in damages. Mainstream media outlets in the US have covered these disasters extensively with CNN reporting on the tragedies of fathers killed by flying tree limbs and dolphins found on front lawns. In reading these sorts of stories, I found myself troubled, becoming increasingly uncomfortable with their subtle ideological slant. Yes, mothers and fathers have been killed by these hurricanes; this is most certainly tragic. But in the narrative media tragedies being displayed to the public, I sensed a veiling of the further-reaching travesty of these hurricanes: that these events are the ominous manifestations of a changing climate. The spectacle of natural disasters has become almost routine in their media depictions. They begin with premonitions, predictions, followed by frenetic coverage of unfolding destruction, ending with a narrative of heroic relief aid. In this way, these occurrences become cultural junctures in which a flutter of commentary and emotional outpourings, almost always the same, arise, consuming the national conscience for several weeks before dissipating from the public imagination. Of course, those who suffer as a result of natural disasters do not see their suffering dissolve so quickly, but the events quickly leave the public eye as the media moves on to other loci of sensationalism. This dissipating effect is even more prominent when these events occur in such quick succession as they did this August and September: Indeed, as I write this, the CNN front page is now displaying images of the destruction of Hurricane Maria in Puerto Rico. Nothing more can be seen about the previous three catastrophic hurricanes. The swift and all-encompassing nature of this media activity should be cause for caution. The quick dismissal of these issues by media outlets, once they have run their course, is indicative of both the needs of capital, which requires the generation of fresh media content ad infinitum, and the obfuscation of the climate crisis that is manifest in the increased frequency of such catastrophic events. 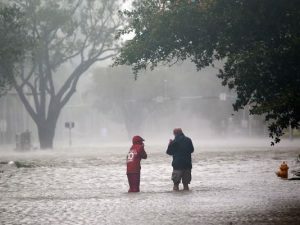 In a USA Today article published on the 26th of September [*1], the writer recounts hopeful stories of revival and reconstruction in communities affected by the hurricanes in the south of the US: Verizon restores wireless service for its customers in a parking lot while hundreds of relief workers are housed in tents and working around the clock. In reading this piece, one gets the sense of a happy restoration to normality. This piece is emblematic of the ideological problem that permeates the coverage and, by extension, the popular perception of these events. It transforms them into narratives that resolve themselves swiftly. The sense of urgency is soothed, the crisis passes into blissful non-existence. A storm-ideology is developed: A framework for perceiving and interpreting these storms as isolated catastrophes is engendered precisely through this fleeting media coverage. Moreover, pieces like this one serve the role of obfuscating the role of ultra-capitalistic entities in these disasters. For example, out of the many articles that I read, hardly any of them mentioned global warming or climate change, let alone the corporate polluters who have invested millions into the dissemination of climate denialism in the US populace. There is no acknowledgement that things are only going to get worse, and that poor communities suffer the most indirectly, though essentially, at the hands of corporate lobby power. There is a marked but subtle refusal in mainstream media outlets to acknowledge this proven and researched reality [*2]. This ideological framework of storms is readily apparent even in the US government under the Trump Administration. When Scott Pruitt, current head of the Environmental Protection Agency, was asked about whether he thought the hurricanes were linked to climate change, he responded saying that the question was “insensitive” to the recovering people of Florida [*3]. Pruitt, a known climate skeptic, put on full display the inability to discuss climate change at length by appealing to this ideologically narrow narrative wherein there is room only to discuss the tragedy immediately at hand. He cleverly evoked the emotional depiction of the crisis in order to shut down any sort of questioning into the collusion between corporate polluters (with which Pruitt has political ties) and politicians. Indeed, this chastisement is almost presupposed in the articles written about natural disasters in the US, as if reporters already feared the judgment of insensitivity prior to their reportage. Of course, it is impossible to say with scientific certainty that the hurricanes of this summer were caused or made worse directly by climate change. I do not intend to make that argument. It is known with some scientific certainty, however, that a warming world brings about more severe weather events such as these. And it unnerves me to see an almost complete lack of coverage about it in the popular media or from our current politicians. Though I would never expect Donald Trump to acknowledge the reality of climate change, the silence of so many others is both unexpectedly and deeply worrisome.The obscuring of the matrix of power that has propelled climate change and continues to knowingly do so through the avoidance of significant treatment of it in relation to severe weather events is even more troublesome. These weather events are critical time junctures in which the public’s attention is focused on the very real, devastating effects of climate change. To ignore it wholeheartedly simply reinforces the storm ideology mentioned earlier as the narrative framework portrayed in media outlets remains uninterrupted. Discussing this crisis is crucial in the aftermath of these events if we are to effectively address this increasingly urgent issue.